The Obama administration is brushing aside new German intelligence reports indicating that Iran has accelerated its efforts to procure key nuclear materials, despite promises to end this behavior as part of last summer’s nuclear accord, according to comments by a U.S. official provided to the Free Beacon. Germany’s internal intelligence agency concluded in a recent report that sources have witnessed "extensive Iranian attempts" to procure illicit materials, "especially goods that can be used in the field of nuclear technology," according to the report. The report appears to show that Iran is not upholding its most critical commitments under the nuclear deal. German Chancellor Angela Merkel made it clear this week that the intelligence shows "Iran continued unabated to develop its rocket program in conflict with the relevant provisions of the UN Security Council," particularly one Security Council resolution that bars Iran from pursuing ballistic missile technology. The intelligence report and subsequent warnings were met with a tepid response from the Obama administration, which declined to comment on the intelligence and told the Free Beacon that it continues to view Iran as complying with the nuclear accord. The administration’s response stands in sharp contrast to that of leading GOP lawmakers, who told the Free Beacon that the White House is intentionally ignoring Iran’s bad behavior. "We believe that Iran is continuing to meet its [Joint Comprehensive Plan of Action] commitments," a State Department official authorized only to speak on background told the Free Beacon. When pressed to explain how this comported with Germany’s warnings, the official said the administration "would refer you to German authorities for any comment about reports attributed to them." The administration official would not take a stance on indications that Iran’s procurement activity—which has increased nearly twofold since the nuclear deal—could violate U.N. Security Council Resolution 2231, which bans such activity. "As for UNSCR 2231, we have spoken previously about ‎how Iran's reported missile launches are clearly inconsistent with the resolution," the source said when asked if the new intelligence shows that Iran’s behavior constitutes a violation of the resolution. A CIA official declined to comment on Germany’s findings and whether they comport with U.S. intelligence assessments. The administration’s response stands in sharp contrast to comments made by many lawmakers who view the German intelligence as proof that Iran is in violation of international accords. Rep. Kevin McCarthy (R., Calif.), the House majority leader, told the Free Beacon that the administration is ignoring mounting evidence of Iran’s illicit actions. "The Obama Administration can’t ignore the sheer weight of evidence showing Iran isn’t upholding its side of the bargain," McCarthy said. 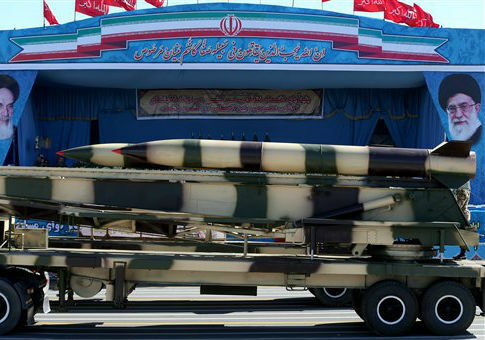 "From illicit procurement for its nuclear program to testing ballistic missiles, Iran is showing that it had no intention of ever following international agreements, even ones that granted them enormous concessions." "The administration’s decision to continue implementing the deal and ignore Iran’s actions isn’t just delusional, it’s dangerous," he added. "Iran must be stopped, which is why we need the sanctions legislation we are voting on this week." Rep. Mike Pompeo (R., Kan.), a member of the House intelligence committee, also said Iran’s behavior indicates that it is not faithfully abiding by the nuclear deal. "The latest German intelligence report on Iran’s efforts to secure nuclear and missile technology and material is extremely troubling," Pompeo said. "While the Obama administration deletes public videos and alters transcripts related to the nuclear deal, at least our allies are speaking out on the threat from Iran’s nuclear program." The German intelligence report’s "naming of more than 1,000 associates of Iranian-backed terrorist groups that are living in Germany should serve as a wake-up call to the U.S. and other European countries who are prefer to ignore Tehran’s active support for entities like Hezbollah and Hamas," Pompeo said. One source intimately familiar with the administration’s thinking on Iran told the Free Beacon that Iran’s illicit activity has forced U.S. officials to walk back certain claims made about how the deal would reform Tehran. "The administration isn't even sure what to say any more. Sometimes they say that the nuclear deal is so weak Iran can't violate it even if it illegally imports nuclear technology," said one senior congressional adviser who works closely on the Iran portfolio. "Other times they say the nuclear deal is really strong, and they just ignore what even they admit are violations, like when Iran accumulated more heavy water than allowed a few months ago." Germany’s disclosure is the latest in a series of revelations that appear to show Iran stretching the limits of last summer’s nuclear deal. The issue of ballistic missile technology has emerged as an issue of concern on Capitol Hill in light of the administration’s refusal to describe Iran’s ballistic missile tests as violations of UNSCR 2231. This entry was posted in National Security and tagged Iran, Iran Nuclear Deal, Obama Administration. Bookmark the permalink.